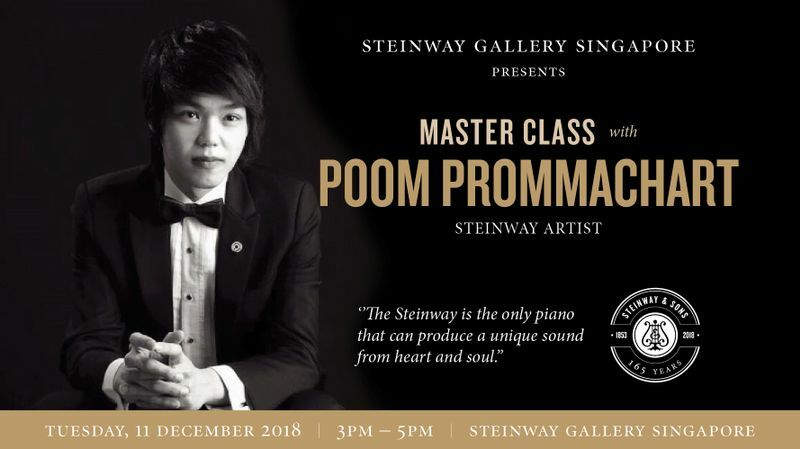 We are honoured to have Steinway Artist Poom Prommachart from Thailand to conduct an open master class at Steinway Gallery. Poom, who has performed throughout Europe and Southeast Asia and worked with many leading Orchestras will debut his solo recital in Singapore this December. With the already developed an international reputation of an outstanding performer of rare expressive depth, and acclaims of critics calling him "a young Ashkenazy" after his performance of Prokofiev's Second Piano Concerto in London. The evening will conclude with a special performance by the students of NAFA and Nabillah Jalal. Each student will be playing a full repertoire a variation of composition from Mozart and Liszt. Kindly RSVP by 10th December 2018 at info@steinway-gallery.com.sg or call 68380525. For more information, visit Steinway Gallery Singapore website.